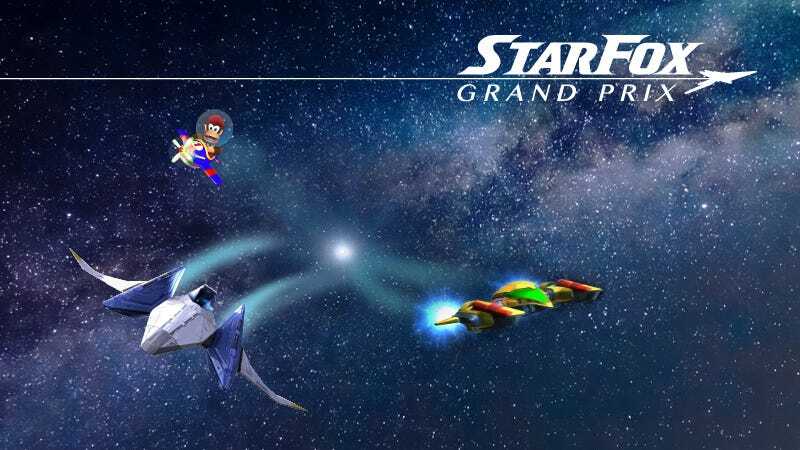 What Nintendo Franchises are Worth Crossing-Over into Star Fox: Grand Prix? With a deep cast of characters, I can’t imagine that the rumored Star Fox: Grand Prix game will have any difficulty filling a roster list with wonderful and (mostly) loved favorites. You’ll have your standards like Fox, Falco, Slippy, and, Peppy. The villains like Wolf and Pigma. Fan service like Krystal. Even some oddball choices like Grippy or ROB 64. But just because there’s already a hefty list to choose from, doesn’t mean we need to stay in the Lylat System to find racers. There’s plenty of off-the-wall inclusions that would make any fan squeal happily. We may have something close to F-Zero in Mario Kart 8, but it doesn’t mean we don’t want a new game in the franchise! Nintendo isn’t afraid to cross the franchise streams. It happened in Mario Kart 8 where their biggest characters met on the race track and even drove through Hyrule Castle along with the inclusion of Inklings and Animal Crossing characters (Though hopefully the inclusion of F-Zero sets doesn’t squash the idea of a new game in that series).With Retro’s pedigree and understanding of some choice franchises, there’s no reason to inhibit that chance for fan-service and creativity. With Retro’s heavy and acclaimed involvement in the Donkey Kong franchise most recently, we can confidently say they understand Donkey Kong. They know what makes a Donkey Kong game work, and how the universe operates. But this is about Diddy, not Donkey, so should we assume that Retro can do what Rare did with Diddy Kong Racing, the title this new game is supposed to take heavy cues from? Flatly, yes. They’ve earned our trust several times over. I don’t think that they should pull a ton from the original Diddy Kong Racing game. Just a couple choice characters is all, like Diddy and Timbur. It even makes some marginal sense to include the villain Wizpig, assuming we include the unrelated Pigma. I don’t think we’ll see them including Donkey as playable, since we wouldn’t want to take away from the main franchise for this spin-off, Fox and Friends. If retro wanted to have real fun, they could add a Diddy Kong Racing inspired planet to fly through. In the same vein as Diddy, Retro has arguably the best understanding of the Metroid franchise outside Nintendo. It’s hard to argue otherwise after the universally acclaimed Metroid Prime series. So who would know better than Retro in how to include Samus and her gunship in a Star Fox racing game? Along with creating my favorite video game series, Retro also designed one of my favorite versions of the heroine’s gunship. So that version will need to make an appearance in the game, along with the classic. The reason I include Samus alone in this is because of her history as a solitary hunter. She doesn’t need an entourage to accompany her into another franchise’s spin-off. I don’t think we need to visit any Metroid locals either, assuming these are located in some far-off galaxy. At most a fly-by of the bottle ship could be a fun nod. If you haven’t kept up, the Dillon’s Rolling Western series of games is a decent line of budget 3DS titles that mix tower defense and action-adventure genres into a weird-but-enjoyable experience with a steep learning curve. I’ve had a decent time with the frachise’s games, and hope that they make the transition to the Switch sooner than later. With that said, there’s a reason I think they should be included in a Star Fox: Grand Prix. Whenever I look at the characters from the Dillon series I can only imagine that they inhabit a lonely planet in the same star system, and that somewhere, a few planets away, Fox and his Crew are keeping the bad guys at bay. It’s impossible that these characters don’t live in the same universe. They are all bipedal, tech-savvy animals! The art style (mostly) matches. They have futuristic guns and stuff. It just makes sense! And if we include those characters we will also NEED to visit one of the dusty post-apocalypse worlds from the franchise (along with encountering some Grocks along the way). Miis have somehow made it into a variety of party-competitive games across Nintendo platforms. Some people hate them. I love them and want to see them making a triumphant return (along with Mii functionality) to the Switch soon. And bar the inclusion of the actual characters from these other franchises, a Mii (& amiibo support for costumes) is the easiest proxy. Nintendo already showed how simple (and FUN!) the possibilities were with the oft-forgotten Wii U title NintendoLand, the Metroid Blast title in particular. Dillon’s latest title, Dillon’s Dead-Heat Breakers, even imports Miis from your 3DS system and turns them into furries to inhabit the Dillon universe. If you’re following my logic of Dillon Universe= Star Fox Universe, then ergo Miis can be furrified as extras in Star Fox: Grand Prix! He’s driven a spaceship before. Thematically, it makes sense for this veteran racer to appear in a similar game in a brother franchise. If he does make an appearance, it’d be wise to stay away from including any of his raceways. Or maybe not... Mario Kart 8 has two. That all said, this won’t happen because doing so would simultaneously: 1. Signal the death of F-Zero racing and 2. Acknowledge the need for F-Zero racing. It would be fun though! Kirby isn’t a stranger to a race track, and there is a palpable desire to see him return to speeding around on the Dragoon. Unfortunately having him appear in a Star Fox game seems incredibly unlikely. The underlying themes (as far as Star Fox being technology driven universe, where Kirby is friendship driven.) are a total mismatch, and the art styles don’t particularly lend themselves to each other, even if zooming past Pop Star would make my Kirby loving heart burst. So what do you think? Are you even excited for a Star Fox: Grand Prix game, or do you think the franchise needs a reboot in some other way? And should the game stay as pure and true to the franchise as possible?